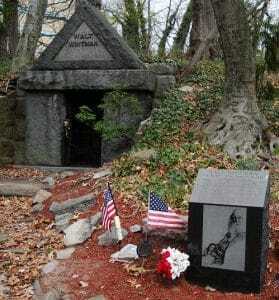 Beginning in the mid-1990s, I began to make pilgrimages to Whitman’s tomb in Camden, New Jersey. The purpose is to pay my respects to the master and also to clean up the area around the tomb. This is an article that ran in the Washington Post shortly after I began my ritual. Over the years, the caretakers of Harleigh Cemetery have taken much better care of the grounds. The writer, Eric Linden did a great job on this story and remains a beloved friend to this day. Read more at I Hear America Raking: My Strange Visit to Spiff Up Walt Whitman’s Camden, N.J., Tomb. I love that you two did this. The quote Erik used at the end of his article truly resonated.